Multiple sclerosis, which affects one in 1,000 people, is frequently characterised by relapses associated with variable functional impairments including among others vision problems, impairment of locomotor functions or difficulties with speech. There is still no cure for multiple sclerosis, and current treatments are based on managing symptoms, especially accelerating recovery phases following a relapse and reducing the number and severity of relapses. Researchers at the University of Geneva (UNIGE), Switzerland, and Geneva University Hospitals (HUG) have identified a DNA-binding factor called TOX that might play a role in triggering multiple sclerosis. They found that TOX licenses immune cells to cause autoimmune tissue destruction in the brain. The results of the research, published in the journal Immunity, deliver important insights into our understanding and treatment of auto-immune diseases. Multiple sclerosis is as much of a mystery today as it has always been. We know that genetic risk factors and environmental factors such as infection or smoking are known to play a role in the development of the disease. However, it is unknown why it is triggered in some cases and not in others. "We decided to analyse the infectious factors by studying the auto-immune reactions provoked by different pathogens," explains Doron Merkler, Professor in the Pathology and Immunology Department in UNIGE's Faculty of Medicine and in the HUG Clinical Pathology Department. "This was to try to pinpoint an element that might influence the development of multiple sclerosis where there has been an infection." The UNIGE researchers selected two distinct pathogens that elicit a response from the immune system, one viral and one bacterial, which were then injected into healthy mice. "We saw a quantitatively identical immune reaction from the lymphocytes called CD8+ T," says Nicolas Page, a researcher in UNIGE's Pathology and Immunology Department. "However, only the mouse infected with the viral pathogen developed an inflammatory brain disease reminiscent of multiple sclerosis." 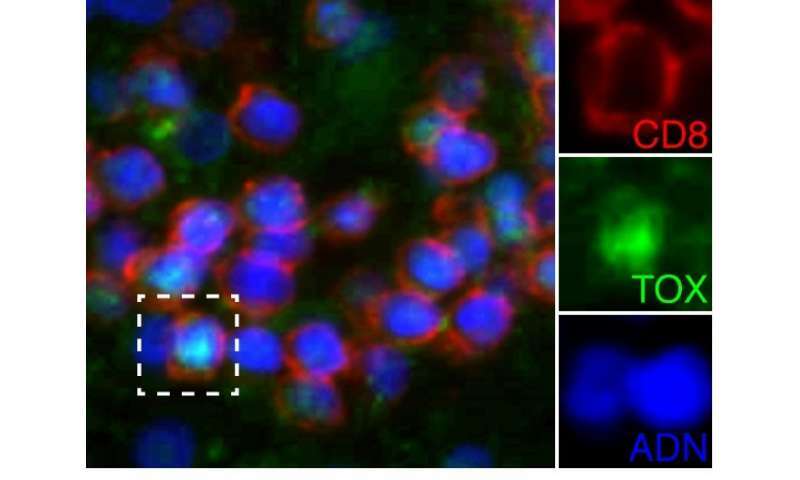 The immunologists validated the link between TOX and multiple sclerosis in the experimental model by eliminating the expression of this DNA-binding factor in the CD8+ T lymphocytes of healthy mice. "And although they received the viral pathogen, the mice did not develop the disease," said Merkler. Following these analyses, the UNIGE researchers noted that TOX was also expressed in T cells present in multiple sclerosis lesions. "This is an encouraging result for understanding the causes of the disease, but there is still lots of work to be done to ascertain what really causes multiple sclerosis in humans," admits Page. The UNIGE researchers will now target the functioning of TOX and its involvement in other auto-immune diseases as well as in some types of cancer.